Coalville City Hall is located at 10 North Main Street, Coalville, UT 84017; phone: 435-336-5981. Photo: John Boyden House, ca. 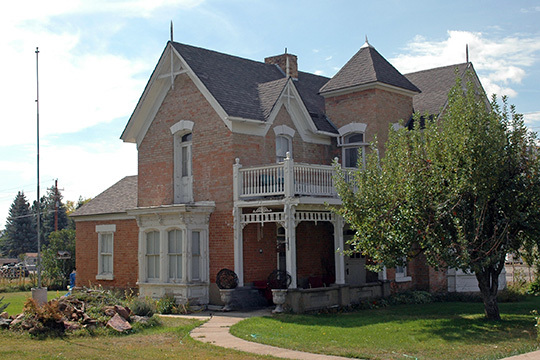 1860, 47 West Carter Street, Coalville, UT. Listed on National Register of Historic Places in 1982. Photographed by user:Tricia Simpson, 2012, (own work) [cc-by-3.0 (creativecommons.org/licenses/by/3.0)], via Wikimedia Commons, accessed December, 2014. Coalville, Utah, is a small community approximately 35 miles northeast of Salt Lake City at the convergence of the Weber River and Chalk Creek in Summit County. First settled in 1859 by four Mormon families, these original settlers were farmers. Less than a year later, however, outcroppings of coal were found in the area. By 1867 seven mines were up and running and ox teams were hauling hundreds of tons of coal to Salt Lake City. The coal was sold for $35 to $40 per ton. In 1866, the community incorporated. In 1880, the completion of two railroad spurs to the silver mining camp of Park City, 30 miles away, gave an immediate boost to Coalville's coal mines, production increased five-fold. By 1908, the town had a population of 1,200 and several businesses, along with an opera house and its own electric light plant. Today, Coalville maintains a rural atmosphere and, although mining has ceased in the area, the population has remained fairly steady at about 1100, with many residents commuting to other areas for work. Sandra Morrison, County Historian and Utah State Historic Preservation Office Staff, Thomas and Jane Beech House, Summit County, UT, nomination document, 2001, National Park Service, National Register of Historic Places, Washington, D.C.